SUPERIOR SOUND QUALITY: Awesome dynamic Stereo sound. With two 5W high quality speakers, this wireless Bluetooth speaker will provide you an impressive volume even at outdoor. Also a great bass ensures a wide and balanced audio range. You can take it to anywhere you like, park, garden, beach, playground,ect. DURABLE & STRONG &RESISTANT DESIGN: IP66 waterproof level, this waterproof bluetooth speaker can work in rain and even if you drop it into water by accident, it will still work without any issues. Dustproof design,can keep high sound quality for long time with no noise. With a high quality TPU& ABS material, strong enough for outdoor using, no worry about dropping and broken.. Unique tank design, with a small stainless steel hook, you can take it while hiking, running, camping and so on. 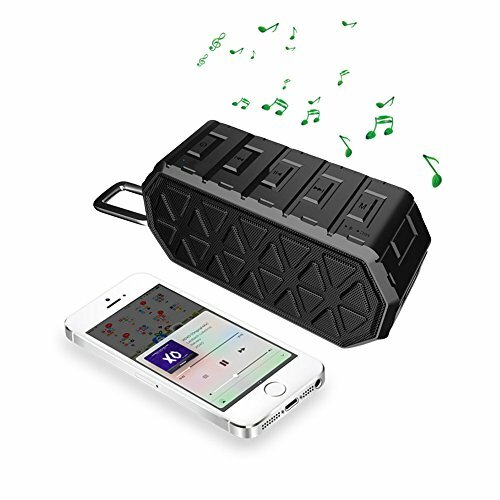 IMPRESSIVE BATTERY LIFE: Only need to charge no more than 2 hours, this INKERSCOOP Bluetooth Speaker has an up to 8-15 hours play time(according to volume level and audio content) with the built-in wonderful capacity lithium-ion 1000mAh battery, allowing you to enjoy the music all day long. Special Tank shape, this mini wireless speaker can provide a extraordinary play time with it\'s small size.